I usually like to post a craft project once a week, but with visiting friends, the holiday, and working on a paper mache creation that's taking too long to dry, I am a bit behind. Thinking of something that's no cost and quick to make, all I had to do was look in my recycle trash bin for a solution. I've always wanted to make jewelry out of plastic bottles . . . I think they are cool, chic and a great way to help the environment (if only in a small way) and to re-use some old PET plastic bottles. PET stands for polyethylene terephthalate Take a look at the bottom of your soft drink bottle and you will most likely find a logo as shown below and the number 1 there. PET is also used to make bottles for water, juice, sports drinks, beer, mouthwash, catsup, and salad dressing. You can also find it on your food jars for peanut butter, jam, jelly, and pickles as well as in microwavable food trays. It is in fact very natural, and is made from really old plants. PET is highly recyclable and can be transformed again and again to un-imagined use such as fiber for carpets, t-shirts, or fleece jackets, fiberfill for sleeping bags, winter coats, and dog beds, industrial strapping; and automotive parts such as headliners, bumpers, and door panels. After cutting out the smooth plastic of a PET soda bottle, draw three or four different circle sizes using a magic marker or sharpie and cut out. Use alcohol to remove the black ink from the circles. Using a lighted candle, hold each plastic circle over the heat from the flame and carefully move the plastic around as it curls up or down. Remember not to get the plastic too close to the flame. 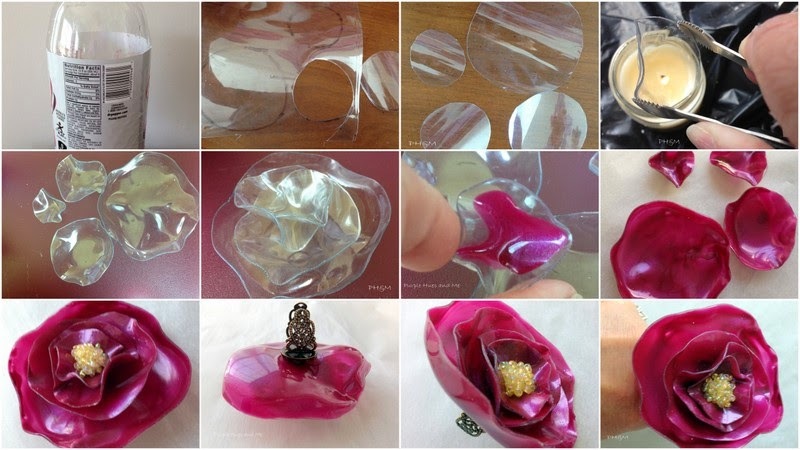 Tweezers can be used to help with holding and shaping the plastic into petals. Once the petals are shaped to your liking and cooled, pour a small amount of nail polish onto the petals and move around until the polish is covering each petal. Allow to dry. Starting with the largest petal, glue the next size, one by one, on top in the center, using E6000 and allow to dry. Mix a small amount of mod podge and seed beads and place in center of smallest petal and let dry. 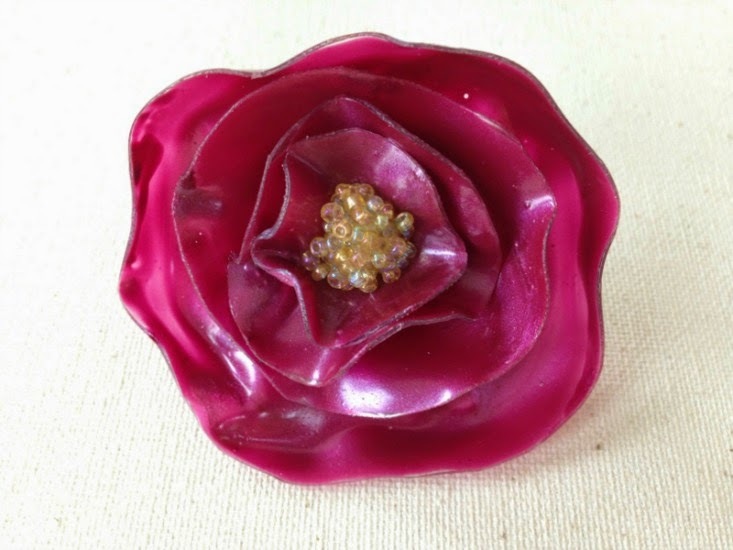 Glue completed flower to ring base using E6000 and allow to dry overnight before wearing. Plastic bottle jewelry is really beautiful and quite different. 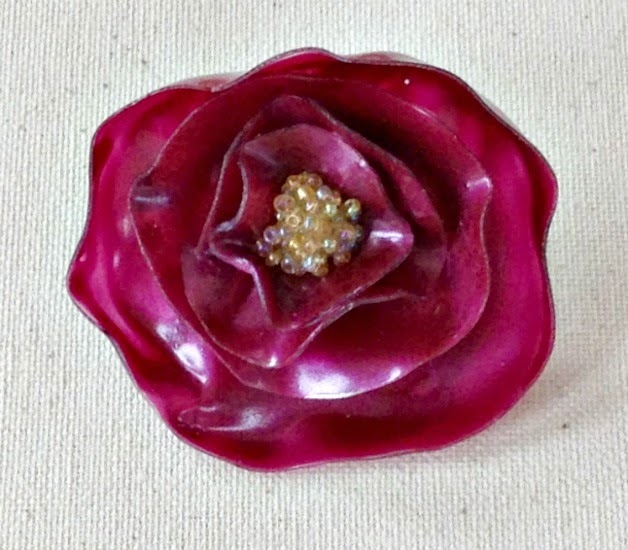 Brooches, necklaces, pendants, in addition to rings, can be made from plastic bottles. Some can be quite intricate with each piece being unique with no two alike. Just use your imagination and try it! This is absolutely beautiful Gail! Love the colour you chose.Oh, I know what it's like to feel like you're behind. I'm feeling like that a lot these days. Great project! I cannot believe this! The ring is very pretty and to think it came from a soda bottle. I am now wondering what you are up to with paper mache. I wonder if I can figure out how to make a button of these. OMG!! This idea is so great! Love, love, love!! Gail, you are the master. This is beautiful and amazing!! Thank you for the tutorial! This is beautiful, Gail! You are seriously so creative! That's amazing Gail, I Love it and I happen to have a ring base I need to check the plastic bottles. Elizabeth will love it. I am so impressed! Great idea. I LOVE this!!! 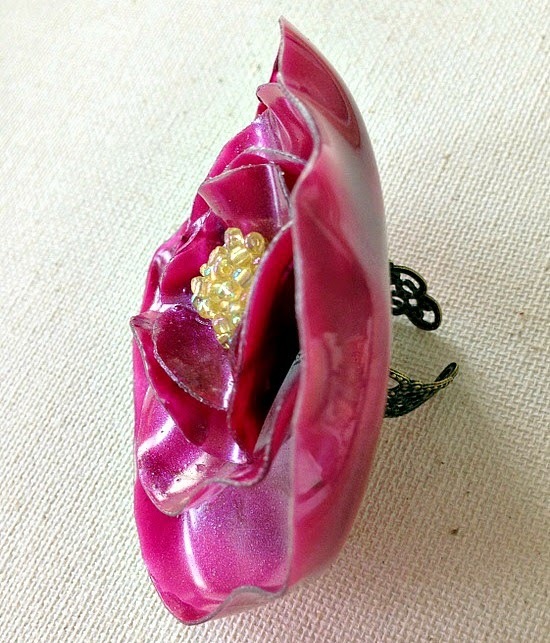 Love the idea of recycling the plastic and love the ring!!! You are very creative! Thanks for your visit, Gail. We are all over the moon with joy, gratitude and love for this sweet little girl. I feel like SHE just won the lottery. Her life will be SO much better now. Oh my goodness... how pretty and creative!!!! Who knew!!!! What a lovely ring! Gail, thanks for your very sweet comments about my Joss & Main sale. How very sweet of you! OMG, that is just awesome. What a clever idea. What a cute DIY, thanks for sharing it with us at the #WWDParty. Have a great weekend! That is so fabulous. I am always looking for something reused upcycled and recycled. Fits that to a T. Love that you added the ring base. Wonderful idea, crafty and beautiful! Hi! Found you via the Say Gday linky party :) This project is amazing! I was wondering where you found a pink bottle but the nail polish is a fab idea. Am totally pinning this to make soon :) Thank you for sharing and gday! What a neat project! I'd love to try something like this. Thanks for linking up to The DIY'ers---hope to see you back on Tuesday! Oh my goodness, this is beautiful and you make it look so do-able! This whole idea is so "right up my street" I can't wait for the weekend so I have a bit of time to give it a go. What a glorious flower! Thanks to Julia for sharing otherwise I'd never have seen it. That looks so pretty. I've just pinned your post and it is also on my Pinterest Page on Facebook. Thanks for sharing at the Say G'day Saturday Linky Party! We love this project and are featuring you today at Elizabeth Joan Designs! It looks like fun to make. I want to give it a try. This is so pretty! I never would have guessed it was once a plastic bottle. The information which you have provided is very good. It is very useful who is looking for Pet Bottles Manufacturer. You amaze me with your creativity, Gail! This ring is so fun and pretty! Gail, This is totally awesome and creative! I can imagine so many uses for this! Thanks so much for sharing! I remember this project. I showed it to my daughter. We played around with a few pop bottles but nothing looked nearly as nice as yours. Beauty from rubbish, how lovely. I have a feeling that nothing is rubbish for you because you see a created beauty in it. I love the ring. Oh my gosh, this is beautiful. I had no idea that you could do something like this. I'm adding it to my project list. I just love reading your blog. You have the most unique projects! Most valuable and fantastic blog I really appreciate your work which you have done about the Drink Bottles,many thanks and keep it up.